One of things we lost when John Carmack left id was his QuakeCon talks – the rambling, unapologetically jargony but uniformly gripping addresses he’d give to the Doom-weaned masses each year. Not even the Doom reveal at QuakeCon 2014 could fill that hole, so here’s the next best thing: a hours-long visit in April to the Lyle School of Engineering at Dallas’ Southern Methodist University. There’s enough Carmackism here to keep you going for two or three lunch breaks. The legendary engineer begins speaking at 1:40, and doesn’t stop for another two and a quarter hours. Here are his own words on the talk’s subject. “Usually I’m happy to just sit down and talk deeply about whatever engineering work I’m doing at this very moment, and I can do that for an almost arbitrary amount of time,” he told the audience in Dallas. 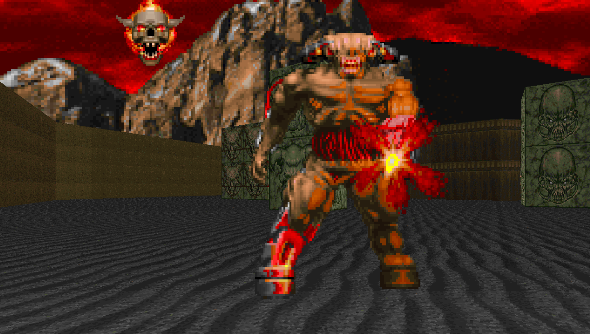 “But since this was called ‘20 Years after Doom’, we’re required to go ahead and do a bit of a retroactive history through the lens of what I’m doing right now in virtual reality. And boy, does he go full circle. Carmack begins with teenagehood and his early sense of “missing the golden age” of computing – and follows right through to his role as CTO at Oculus VR. Have you missed him?